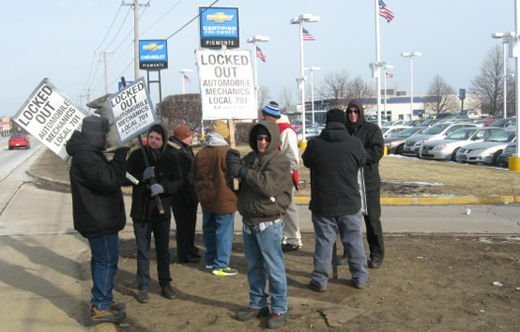 EAST DUNDEE, Ill. – The automobile mechanics strike here at Al Piemonte Chevrolet, now over 30 weeks long, has deteriorated into a lock-out situation. The strike began on July 9, 2014, after the shop was organized by Automobile Mechanics’ Union, Local 701, IAM. The dealership management, lead by Mrs. Piemonte, refused to bargain in good faith. 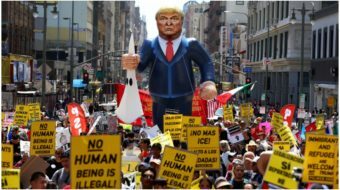 They not only refused to sign the Standard Automotive Contract, but even refused to accept some pretty large concessions. Instead, the owners demanded drastic concessions, particularly to health care and pension benefits. 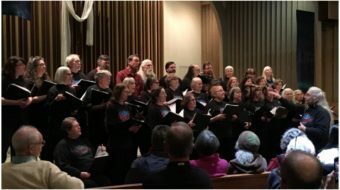 A long and bitter struggle ensued, with the Piemontes going on the offensive, regularly abusing and threatening the Strike Team, even to the point of physical assault to the strikers and destruction of public property with use of heavy equipment, while the east Dundee police looked on without interfering. And it seems like the recent election of anti-union Republican multi-millionaire Bruce Rauner to Illinois governor has only emboldened the Piemontes. In a meeting with the dealership’s attorney on January 14, it seemed some progress was being made — until the attorney told the Union that the employees have been permanently replaced! This is at minimum considered an “Unfair Labor Practice” and at maximum, criminal wrongdoing. The cases against the dealership and the negligent police department have yet to be heard in court and the National Labor Relations Board has not yet acted. In the meantime, our Union stands strong alongside the strikers and is calling for solidarity with all working people. personal sacrifice and risk, and for over six months have been standing the line for all working people. Show your support by coming over and standing with us and tell them Keri sent you. Thank them any way you can for standing, and, of course, never cross this or any other picket line! 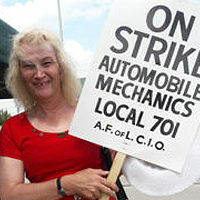 Keri Rautenkranz is a regular People’s World contributor and an auto mechanic in the Chicago area, one of the victorious workers of AMU Local 701.